If you’re feeling stressed by family life, you’re not alone. With technological advances and cultural changes, we have more options. That’s great, but with more options comes more complexity. Every decision you make — and you make thousands in a day — costs energy and willpower. But if you opt out of decision making, and quit managing the complexity, you get chaos. Missed communication, scheduling conflicts, and last-minute frenzy don’t create a peaceful family life, that’s for sure. Every family is different, of course. I’ll share some ways I use Teamup with my family; apply these concepts in your own way to manage your unique family life. With four kids, I have a lot of information to manage. So I created one central Family calendar with sub-calendars for each member of the family. I also have sub-calendars for my work, editorial schedules, and a shared calendar with extended family. Having a different calendar for each person — or activity — keeps me from getting overwhelmed. I just toggle the view of each calendar on or off. I can also share appropriate information without sharing all the information. My kids want to know our travel plans, but they really don’t care about my work deadlines. You can use as many, or as few, sub-calendars as makes sense for your life. You can even organize sub-calendars into folders. 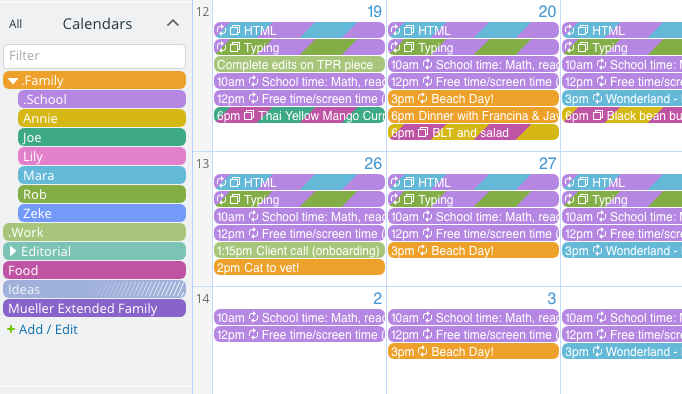 If one area requires a lot of scheduling, it often makes sense to break it into a separate sub-calendar. My husband and I both have admin permission for the main family calendar. The kids have add-only permission for their sub-calendars and read-only permission for the main family calendar. If you’ve created a sub-calendar for each member of your family, keeping track of school will get much easier. Imagine seeing that a project is due the week before, instead of the night before! Everything on the school calendar — starting and ending dates, half-days, field trips, school events, etc. — can go onto your Teamup calendar. No more last-minute surprises. Individual assignments, from homework to project due dates to tests, can go on the individual’s sub-calendar. Older kids can add their own items via the app or a browser if they have study group, an extra rehearsal, or need a ride somewhere. It’s a much better method for managing school scheduling than crumpled notes and last-minute text messages. I tend toward extremes when it comes to menu planning. One month I’m using some over-complicated systems with detailed spreadsheets and ingredient lists. The next month, I’m burned out and winging it, texting Joe to grab take-out, again. In both cases, I’m the only person planning and managing all the meals. Teamup has helped me end that unwanted dictatorship. A dinner plan assigned to Joe with notes, link, and photo. 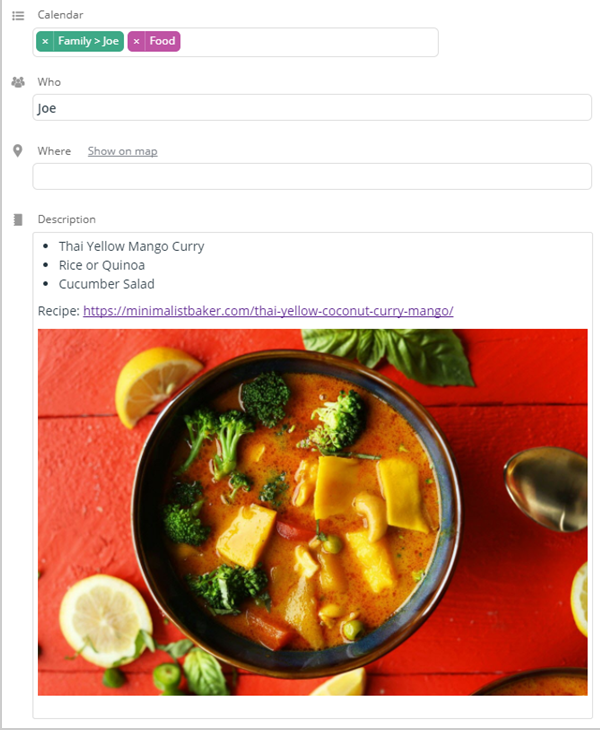 Step 1: By creating a menu plan on a shared calendar, everybody can see what’s for dinner. I no longer hold all the knowledge in my brain (or some other, equally inaccessible place). Step 2: By assigning a meal to a person, everybody knows who is in charge of what. I’m no longer the default dictator of all-things food; delegating meals means sharing the load. 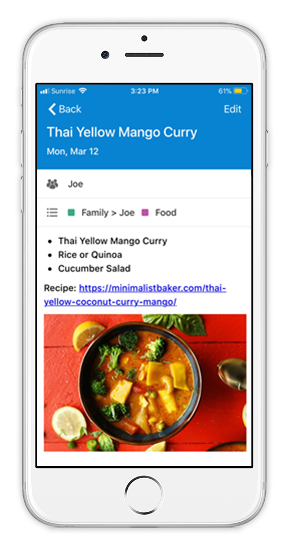 Step 3: By attaching the right information — a photo, grocery list, recipe, or link — to the calendar, everybody can be flexible and step in when needed. Joe can take on my assigned dinner when I’m running late; all the information is there, right on his iPhone. An event for a dinner plan as seen on mobile. You can use the same concept with any other household area you want to share and delegate. If you find yourself bearing the sole (mental) burden of chores, cleaning, yard maintenance, laundry, errands, the reason may be lack of a system. A shared calendar functions as an all-in-one system: schedule, upload pertinent information, assign, and share. Read more about delegating tasks and scheduling. Money’s important, of course, but it can also be stressful. In fact, communicating about finances is a top cause of stress in long-term relationships. Having a shared, neutral space to organize and manage finances can help reduce that stress. You can schedule recurring due dates for bills, payment reminders, and important financial activities such as gathering documents for tax preparation. Getting all the information in one calendar makes it easier to manage. Sharing the calendar means you don’t have to manage it alone. You can also use a shared calendar for more fun financial incentives. Keep track of how you’re paying off debt, accumulating savings, or building up that travel fund. The more complex your financial situation, the more detailed you can be: you can create specific sub-calendars, add users with specific permissions, upload attachments, and keep detailed notes. You can also clearly assign who’s in charge of doing what (and when!). A shared calendar won’t make your kids remember their manners or give you more hours in the day. But it can reduce the chaos of family life. Get all the information in one central place that each family member can access in the way they prefer, via the web or using the mobile app (iOS or Android). How could your family life benefit from a Teamup shared calendar?